A boxed set of three all-new films from PBS's most-watched 'Masterpiece Mystery!' series is planned for Blu-ray this July. 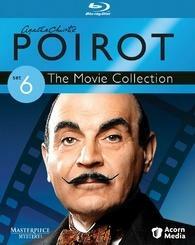 In an announcement to retailers, Acorn Media has just revealed 'Poirot: The Movie Collection - Set 6' for Blu-ray on July 12. ITV Studios’ Poirot has aired on ITV1 in the U.K. since 1989 and on PBS and A&E in the U.S. BAFTA nominee David Suchet returns as Hercule Poirot — Agatha Christie’s elegant Belgian sleuth of unsurpassed deductive powers and peerless viewer appeal — in three baffling new cases based on her classic novels. Three Act Tragedy — After guests at successive dinner parties mysteriously drop dead, Poirot teams up with an old friend, retired stage star Sir Charles Cartwright (Martin Shaw), to ferret out the killer. Guest stars include Jane Asher, Art Malik, and Kimberley Nixon. The Clocks — As Britain readies for war, Poirot journeys to Dover to help the son of an old friend solve a case involving an unidentified corpse and four mysterious timepieces, all stopped at precisely the same time. Anna Massey guest stars. Hallowe’En Party — Crime novelist Ariadne Oliver (Zoë Wanamaker) calls Poirot in to investigate the macabre murder of a young girl at a children’s costume party who claimed to have witnessed a killing. Also stars Sophie Thompson, Deborah Findlay, and Amelia Bullmore. Specs and supplements have yet to be revealed, but supplements list price for the Blu-ray is $59.99. You can find the latest specs for 'Poirot: The Movie Collection - Set 6' linked from our Blu-ray Release Schedule, where it's indexed under July 12.